The Aviation Maintenance Administrationman (AZ) was established as a rating in 1963. Their initials for the Navy rating is AZ because Aviation Maintenance Administration does everything from A to Z. 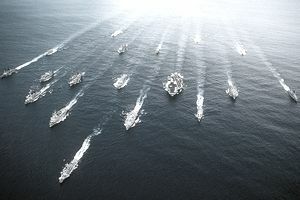 Since its establishment, the Chief of Naval Operations has moved away from traditional ratings to an alphanumeric system of Navy Occupational Specialty (NOS) codes. So the AZ rating is now under NOS as A440. No longer will the enlisted members be called by their rate as well. So a Petty Officer Third Class, who is an E-5, in the Aviation Maintenance field will not be called AZ3 buy his peers and higher ranking members of his chain of command. He/she will simply be called Petty Officer _______ (name). AZs are required to have diverse organizational and technical skill sets and they perform multiple roles within an aviation command in different work centers such as the Maintenance and Production Work Centers. Such important Logs and Records within a division, track aircraft, component hours, and even hours on individual bolts or screws. Each time the aircraft operates, Aviation Maintenancemen are required to track their lifespan. Any calculations or logbooks not maintained properly and the command can have aircraft that are grounded, or worse, have pilots and aircrew who do not come back home safely. The pilots and crew rely on the Aviation Maintenance Administrationman and their meticulous attention to detail. This is the attention to detail that brings the pilots and crew members and their aircraft back home safely. The AZs are adept at spreadsheet creation and perform calculations constantly and requires other members of the rate to back them up and ensure accuracy. Everything in the Aviation command must be properly documented, checked twice for accuracy, and properly filed and logged as any incident or inspection by the command, FAA, or National Transportation Safety Board can lead to lives lost and careers ending. The Aviation Maintenance Administationmen are accountable to the Maintenance Chief, Master Chief, and Maintenance Officers. Aviation Maintenance Administrationmen typically work in a clean, comfortable office environment. Places of work vary depending on whether they are assigned to sea or shore duty. The tasks they perform are mostly mental and require close cooperation with fellow workers. AZs may be assigned to an aircraft or helicopter squadron that may deploy on Navy ships. Opportunities also exist to work in squadrons based at overseas sites or within the continental United States. Note: Advancement opportunity and career progression are directly linked to a rating's manning level (i.e., personnel in undermanned ratings have greater promotion opportunity than those in overmanned ratings).